Since the mini-crash that took place in the Shanghai stock market in August, financial instability has resurfaced in the markets and the media and, once again, the link with financialisation has been evoked. The Chinese crisis resulted from a combination of real estate and stock market bubbles that were fed by the abundant savings of a middle class in search of high-yield investments. It feels like we’ve gone back almost ten years when what is considered the excessive financialisation of the US economy – with abundant savings from the emerging countries enabling the build-up of widespread US consumer debt – is treated as the cause of the financial instability and crisis that was triggered in the summer of 2007. Is there really a link between, on the one side, increasing indebtedness and the great variety of financial investments, and on the other, volatile stock prices and a deterioration in the quality of bank loans? And if there is, what is the direction of the dynamics: from financialisation to financial instability, from financial instability to financialisation, or both at once? A rise in indebtedness could well lead to increasingly risky lending to agents who wind not being able to repay them, which would then lead to a financial crisis: this is one possible case. The occurrence of a crisis would change the behaviour of households and firms, causing them to reduce debt: this is the second case, in which financial instability reduces the financialisation of the economy. Depending on which is the case, the public policies needed differ. In the first, we need to monitor the degree of the economy’s financialisation and target, for example, a maximum ratio of bank credit to GDP in order to prevent the rise and bursting of speculative bubbles. In the second case, there are two possibilities: to treat the causes, and thus to monitor the quality of loans to households and business so as to ensure the proper allocation of capital in the economy; or to treat the consequences by supporting productive investment to annihilate any rationing of credit. In the course of the debate on the links between financialisation and financial instability, and on the consequences to be drawn in terms of public policy, the European situation is interesting for two reasons: the European Union has set up a system for monitoring external imbalances, including financial ones, from 2011, and a banking union since 2014. In a recent working paper, we look at this debate for several groups of countries in the European Union over the period 1998-2012. At first glance, the relationship between these two concepts is not easy to demonstrate, as can be seen in the graph below. It shows a scatter plot that for each year and for each European country gives the levels of financialisation (approximated here by the share of credits / GDP) and of financial instability (approximated here by non-performing loans). The correlation between these variables is -0.23. We test the two typical cases discussed above. We call the first case the vulnerability effect. As financialisation develops, it engenders a sort of euphoria that leads to granting loans that are increasingly risky, which fosters financial instability. This hypothesis derives from the work of Minsky (1995) . We simultaneously test the potentially negative relationship between financial instability and financialisation, which we call the trauma effect. The very occurrence of financial instability as well as its impact encourages economic agents to take less risk and to shed debt. 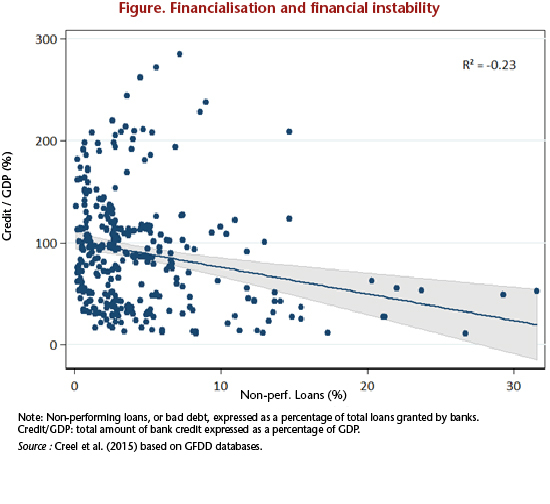 Our estimates show that the link between financial instability and financialisation is not uni-directional. Contrary to what is suggested by the simple correlation coefficient, the sign of the relationship is not the same when looking at the effect of one variable on the other, and vice versa. Both the vulnerability and the trauma effect have been at work in the European countries. A macro-prudential policy intended to monitor the policy on granting bank loans, in terms of their volume and quality, therefore does indeed seem necessary in Europe. We also tested the possibility that these effects are non-linear, that is to say, that they depend on reference values. The vulnerability hypothesis depends both on the level of financialisation (the higher it is, the stronger the relationship) and on time. This last point shows us that the positive relationship between financialisation and financial instability shows up at the moment of crisis for countries that are already heavily financialised. Finally, in the countries on the EU periphery , long-term interest rates and inflation rates greatly influence the financial instability variable. Consequently, it seems that for these countries there is a need for strong coordination between banking supervision and macroeconomic surveillance. Minsky H. P. (1995), “Sources of Financial Fragility: Financial Factors in the Economics of Capitalism”, paper prepared for the conference, Coping with Financial Fragility: A Global Perspective, 7-9 September 1994, Maastricht, available at Hyman P. Minsky Archive. Paper 69. This group consists of Spain, Ireland, Italy, Greece, Portugal and the countries from the Eastern enlargements in 2004 and 2007. The establishment of this group is explained in the working paper.